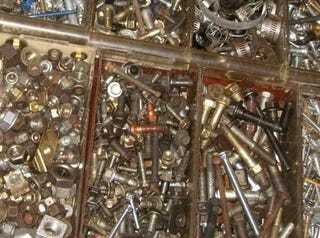 How Well Organized Is Your Junkyard Fastener Collection? You're at the junkyard pulling some parts, and you toss all the fasteners into your toolbox. Next time you clean out the ol' junkyard toolbox, you'll move all those nuts and bolts and washers to… where? Big Or Little Junkyard Toolbox? There's the "dump 'em in a big bucket, let God sort 'em out" method, which saves time up front but means you'll spend hours digging through 100 pounds of greasy junk every time you need a certain bolt. Then there's the "sort 'em obsessively by size/type and put them in eensy, well-labeled drawers for later use" method, which takes for-freakin'-ever but pays dividends when you're working on your Hell Project at 2:00 AM and all the hardware stores are closed. My method is half-assed organized; I have drawers for broad categories of fasteners (Long Bolts, Lock Washers, Machine Screws, etc.) and mix all the metric and SAE stuff higgledy-piggledy. A few Whitworth bolts have found their way into the mix, just to add to the fun. Hose clamps, weird pressure fittings, gauge senders, and other oddball crap gets quasi-sorted as well. The upshot: after a quarter-century of junkyard scrounging, I've got a big enough collection of hardware to find what I need… if I'm really motivated. How about you?